If you're anything like me, you have a sweet tooth and thoroughly enjoy a sweet treat every day now and then. Well, if you're watching what you eat, then a daily sweet treat may not be in the cards. Cue the sugar free gum! 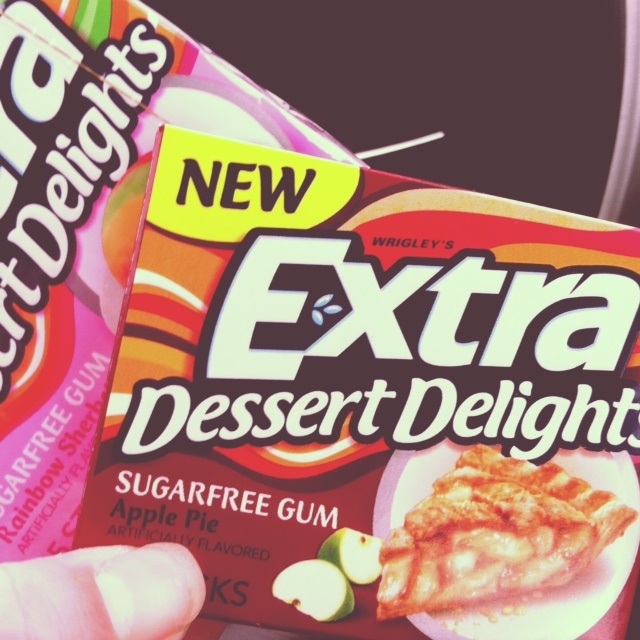 I picked up 2 packs of Extra Dessert Delights, and they both so yummy! The Rainbow Sherbet is fruity and good, but the Apple Pie flavor is AH-mazing! It literally tastest just like Apple Pie, no joke. And, the single packs were on sale for $0.69 each at Walgreens! 1. If calories didn't count, I would eat... Chipotle, brownies, mashed potatoes and Snickers every.single.day. 2. On my Prom night....I didn't go to my senior prom. Instead, I tried out for my college's dance team. I didn't make it. Womp, womp! 3. When I go to the store, I always buy...spinach. I think I may have gotten through the whole bag maybe once before it's gone bad. 4. Family functions typically... are so fun with lots of laughs! 5. I think my blog readers...are AWESOME! 6. I'd much rather be.....taking a nap. 7. I have an obsession with....NCIS. Mark Harmon is a silver fox! 8. My work friends....are awesome. And super supportive. 9. When I created my Facebook account....I was a junior in high school. And, there were no moms or g-mas running around the joint. 11. Justin Bieber....needs to pull up his pants and stop acting so weird. We get it, you're trying to find your "thing" but, so far, it's not workin' for ya. How is everyone's Friday? Hopefully it is going splendidly! Ok, so I have mentioned before that I am trying out for an NFL Cheerleading squad. And, guess what? I made it past the first cut and am currently preparing for final auditions! As part of the process, there is online voting, and if you have a spare minute, I would love your support. You can vote right here. On the second page, it asks for your info, but don't worry, there is a "Bypass" button at the bottom of the page. I am on page 5 at the bottom (Tori T). 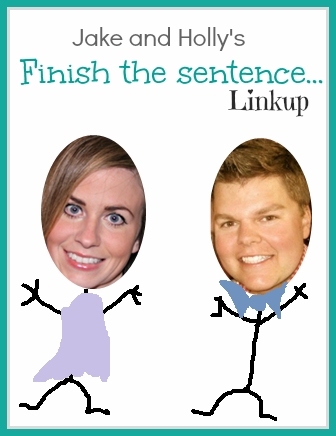 If you feel compelled to do so, please pass on the link and share with your friends. I would forever be grateful! For those of you that are curious, here's a little of the back story in regards to what I like to call my "journey to the field." I have tried out for the same team three years now and made it to finals each time. It's an amazing group of women who serve as ambassadors to the St. Louis community and pride themselves on being well-rounded, classy and professional women, and I would be so honored to be held to that same esteem. I have worked really hard preparing myself for hopefully being a part of this organization, from everything to working out and eating well to bettering myself mentally and professionally. I keep coming back because it's such a positive experience, and I really think I would be an asset to the group! Thank you so much for voting and for supporting me along my journey. I cannot explain how much it means to me to have everyone's support! I am so lucky! I am making the switch from Google Reader to Blog Lovin'. It's super easy to do. Follow this tutorial if you want to make the switch, too! 1. People always tell me... that I look like these random celebrities that I clearly don't look like. And that my sister and I look just alike. HELLO! She's adopted...ok, not really, but she looks like my Dad's side and I look more like my Mom's side. People are ca-razy! 2. I always ask to leave off the.... onions and mushrooms, both slimy and disgusting. 3. Kim and Kanye really... are perfect for each other. Douchey and douchey-er. But let's be honest with each other, I can't stop watching anything Kardashion-related. It's like a car accident, you just can't look away! 4. My parents mom always reminds me... to put something on my lips. She has at least 3 different types of chapstick, lip balm, etc. in her purse at all times. 5. Every single day I... wish I could either sleep in or take a nap. Like I've mentioned in previous posts, I am generally a VERY sleepy person. 6. This one time in College... I drove to and from San Antonio, TX (13 hours each way) within a 36 hour time frame with my sister, brother-in-law and his brother. We went down to see Mizzou football play in the Big 12 Championship. We didn't win, but the trip was fun! Tex-Mex anyone? 7. My grossest habit is... like Holly said in her answer to this question, picking. I like to pick scabs, my skin, my boyfriend's skin, my dog's skin. It's gross, but weirdly addicting. 8. I know all the words to... Got Money by Lil Wayne. What? It's a good song! 10. I will never, ever... have a snake as a pet. I have had nightmares about snakes since I was a little girl, and those slimy things still haunt my dreams. Ick! How is everything in your world? It's still crazy around here, but it's been less stressful this week. Hallelujah! Happy Friday JNSPers! I have been mulling over some blog content ideas this week, and I think I am ready to take the jump and start sharing my health/fitness tips, tricks, routines, etc. Before we get started, let me just say that I am not a nutritionist or doctor, so please keep that in mind. I am going to share what works for me, and maybe it will work for you too! As I have mentioned a few times before, I am trying out for an NFL cheerleading squad this spring. Being a cheerleader in the NFL means being physically fit and an all-around healthy person. Try outs are a great motivator to get and stay in-shape and develop healthy eating habits. As a side note, many, if not all, NFL cheerleading squads also pride themselves on being ambassadors to their community. This aspect of these organizations is one of the many reason why I want to be involved and represent my city with pride. Let's get to it! For the first Fitness Friday edition, I would like to share my recent finds for snacks at work. For me, it's so important to eat every 3 hours because if I don't, I will get hungry, and I tend to make not-so-good food decisions when I am hungry. Also, vending machines are staples at many workplaces, and they usually don't have good options for snacks. To make good food decisions, it's important to have healthy options on hand, making it a no brainer when it is snack-time! Tuna Pouches with Yellow Mustard: Each pouch only has 70 calories, and they were on sale at my local grocery store for a $1 each, a win-win in my book! 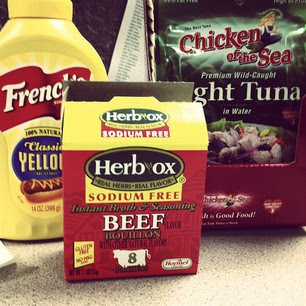 Hormel Herb Ox SODIUM FREE Bouillon: Too much sodium = too much bloat, which = no good! There are only 10 calories in each packet and each packet only needs 1 cup of hot water. Easy and yummy! Eggland's Best Hard Cooked Peeled Eggs: I love having hardboiled eggs as snacks, but they are smelly to cook and are a pain to peel, so these are perfect for me. Whole Natural Almonds: Grab a small handful for a quick, filling, and nutritious snack. What are your healthy snack staples? Please share!